As a reader of David Hobby’s Strobist site I became familiar with the annual Gulf Photo Plus event held in Dubai each March primarily from the descriptions and videos of the “Shootout” with which they close each year. Last January he made a compelling argument to attend in his Five Reasons to Go to Dubai for Gulf Photo Plus 2013 post. Unfortunately, two months wasn’t going to be enough time for me to get everything together so I started planning on GPP 2014. As it turns out, having a year to prepare worked out quite nicely. First there was the matter of expense. When traveling half way around the world it doesn’t make sense to cut unnecessary corners, but cost is a factor. I was afraid that the travel costs would be excessive, but some quick research showed me that a round trip fare from Phoenix to Dubai was going to cost around $1200. The hotel cost would be about another $1000, and I budgeted another $1000 for food, taxi, trinkets, and expenses. This left the cost of the workshops. After looking at the 2013 schedule and trying some variations on different classes, it looked like $300-$350 per day would be a good planning number. So around $5000 would cover the trip. Since my wife Karen is also a photographer, I doubled my estimate. OK, it’s not cheap, but when you look at quality training $500 per day per person is actually pretty reasonable. Both of us put vacation money aside and with a year to prepare this was going to be something we could do. Next up was trip preparation. I’ve traveled overseas before, but this was going to be Karen’s first trip out of the country. While there are no special requirements to visit Dubai, she still needed to get a passport. This turned out to be fairly quick, less than a month between making the application and having passport in hand, but it’s not something I would want to try at the last minute. There are no immunizations required and a tourist visa is obtained at the Dubai airport so the official paperwork was done. Now to the meat of the program – what workshops to take. Looking at the list of regular instructors I made a wish list: David Hobby, Joe McNally, Gregory Heisler, Sara Lando, Zack Arias, Bobbi Lane and Lindsay Adler were all on my list, but I knew I wouldn’t be able to attend all of them. Finally, in December the Workshop schedule came out so I could make my selections. Since I also like wandering around taking photos of whatever catches my interest, I decided to take some street photography workshops as well. Seeing Eric Kim on the docket I jumped on Shooting Urban Landscapes. I like his style and find his blog to be a rich source of information, so I was really pleased I could catch a workshop with him. David Nightingale’s Shoot the Street was also something I wanted to check out, and Karen had also selected it as one of the workshops she wanted to take. This course was as much about post processing as image capture, and was almost two workshops in one. I believe that in order to grow one needs to get out of the comfort zone. Working with Nothing: Building a creative scene in a boring space and in Photoshop with Brooke Shaden fit the bill. I had learned of her from Jen Brook’s website and while I’m not a fine art photographer I wanted to learn some of the tools and techniques she uses. As expected I wouldn’t get everything I would have liked – Gregory Heisler’s courses were Masters Class material and I’m not in that league. I just plain couldn’t fit Bobbi Lane and Lindsay Adler into the workshop schedule, so there will have to be a rain check for them. I have DVD and video courses for David Hobby and Joe McNally, and since David has retired from the seminar circuit I wasn’t expecting that to work out anyway. I hope to find one of Joe’s workshops closer to home. Speaking of closer to home, I was looking at Joel Grimes and then found he had moved his studio to within 15 miles from my house, so I’ll be looking as some of his workshops locally. Since there were chances to hear them speak through out the week at special events I was somewhat consoled. Given the wealth of opportunities and the limited time it’s easy to see why people attend GPP year after year. 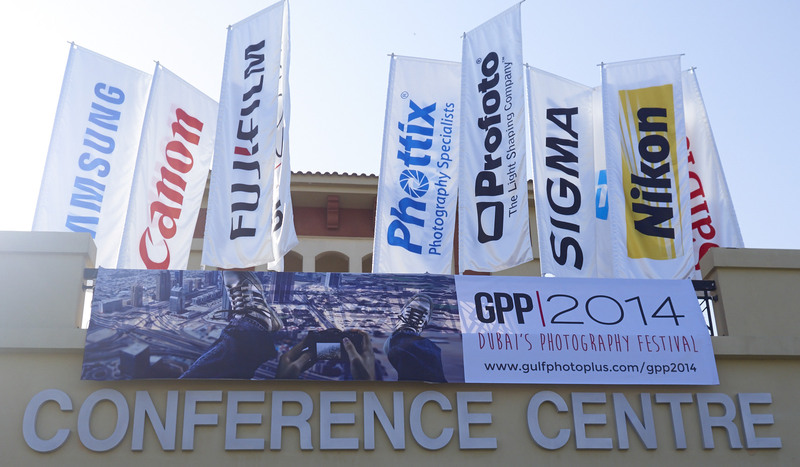 This entry was posted in Workshops and tagged Dubai, GPP 2014 on March 20, 2014 by Phil Ryan.